Although I wholeheartedly endorse connecting with people personally (rather than with automated messages), there is a strong argument to be made in favor of bots that function to get customers what they need a little faster, and a lot easier, than they could with humans alone. 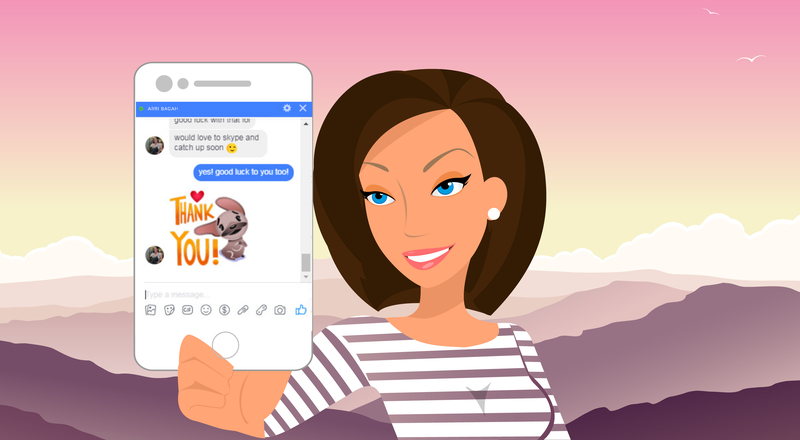 With that in mind – bots as Customer Success tools – I give you this fab interview with BAMF’s Arri Bagah – Head of Chatbots. Because this is the next big thing, if you do it right. Chatbots let businesses communicate with their customers inside of social media messaging apps. Haven’t heard of them? Facebook only made them available just over a year ago. 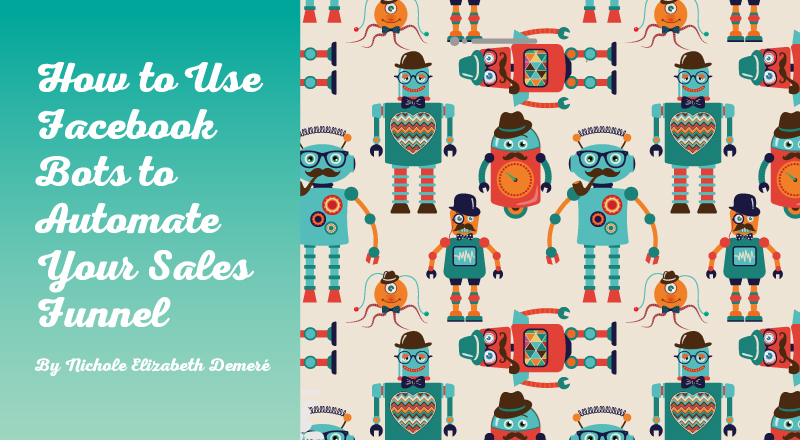 In this article you’ll learn how to use bots to delight your customers and smooth out the rough patches at every stage of your sales funnel. The main appeal of chatbots for businesses is that they’re on 24-7, which means they can answer questions and nurture consumer relationships when humans aren’t available. On the other side, consumers appreciate being able to ask a question and receive an immediate answer, or schedule a consultation in a fraction of the time, or have a funny conversation that helps them decide what to buy. Bots can be downright loveable – for everyone. For those reasons, and many more (which we’ll get into), bots are poised to become the next big thing. If you like being in the lead of cresting trends in marketing, you’re going to need one. But, do you need one right now? That depends on your target demographic. According to Arri Bagah, BAMF Media’s Head of Chatbots, the greatest adoption of bots is with consumers between the ages of 18 and 35. But that doesn’t mean older consumers aren’t willing to engage with bots – not by a long shot. Older consumers are more used to email for communicating with businesses, but the fact that they’re already spending so much time on messaging apps means there’s opportunity there. If your target audience is older, you may have a little time before you really need to consider using bots in your marketing and customer service, but… not much. Social media messaging bots are offered on multiple platforms, but if you have to choose one, Chatbot expert Arri Bagah leans towards Facebook because “that’s where everybody is.” Facebook Messenger has 1.3 billion monthly active users worldwide – more than the Facebook app itself. That does not mean your business can chat up any of those 1.3 billion users, however. There are rules. Messenger Bot Rule no. 1: They have to come to you. 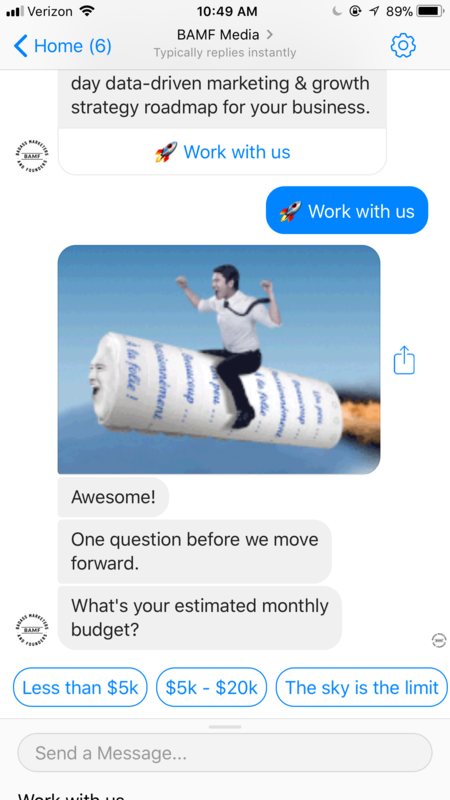 Brands can only send promotional messages within 24 hours of a customer initiating a conversation with the business page by messaging it, or by explicitly ‘opting in,’ within the past 24 hours. After the end of that 24 hour window, the business can send one follow-up message to active subscribers. After that, the brand can’t send ads or promotional messages until the consumer interacts with them again. It’s called the 24 + 1 rule. Messenger Bot Rule no. 2: No email free-for-all. Businesses can’t download email addresses of their Messenger subscribers. Messenger Bot Rule no. 3: Users can block you. Facebook users can block conversations with a tap, giving them ultimate control. Here’s what Facebook Messenger can do. Messenger can send notifications to users’ phones every time they receive a message. If they don’t have notifications turned on, Facebook will keep prompting them to turn them on. Emails easily get buried, but it’s very difficult to ignore a chat message. All of these factors result in increased conversion rates, because Messenger only allows you to send promotional messages to people who’ve shown interest in the product. They’re warm leads, if not downright hot. 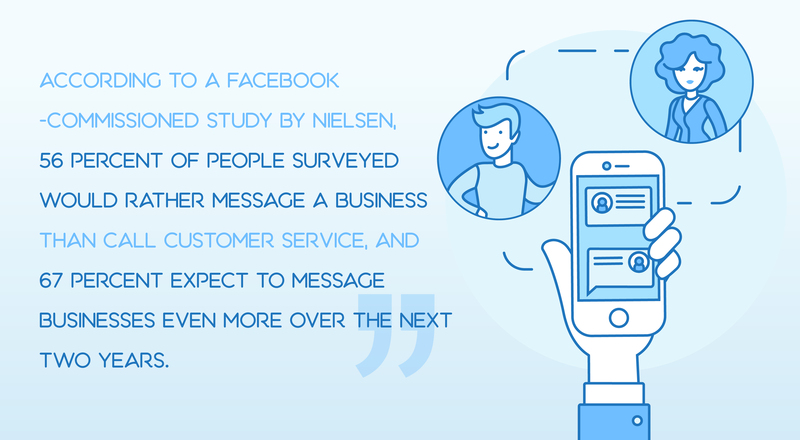 According to a Facebook-commissioned study by Nielsen, 56 percent of people surveyed would rather message a business than call customer service, and 67 percent expect to message businesses even more over the next two years. Very few people understand what bots can do, especially this early-on. Arri Bagah is at the forefront – his day job is helping companies increase sales with bot campaigns that are so much more than just automated messages. Because that’s what many early adopter businesses are getting wrong. They only scratch the surface of bot capabilities, using them mostly for customer service. That’s just the tip of the bot-berg. Here’s how to do bots right at every stage of your sales funnel – from top (TOFU) to bottom (BOFU) and in-between (MOFU). Note: Bots cannot be used with personal profiles, only with a Facebook page. The Top of the Funnel is when prospects are “just browsing” – they’re checking out their options; unsure whether they need something, or even want something. This stage is when a high-value freebie offer can grab attention, but these types of campaigns are usually done through email. Not anymore. Pro tip: Anything email can do, bots can do better. Do a quick survey of your Facebook fans to see what your audience wants to learn. Then create a high-value freebie offer around that, like a 5 day e-course. Create a Facebook post (which you’ll want to ‘promote’) that asks users to comment using a specific keyword to gain access to the free content. Send the 5-day e-course via Messenger bot. Plan for 1 great tip per day. At the end, have your bot present an offer that will help your prospect take the next logical step toward his or her goal. Arri warns that whatever you offer should be genuinely valuable to overcome the natural distrust people have about opting in to Messenger. It’s a substantial amount of friction at first, but once you gain their trust with helpful information, they’ll warm up fast. The middle of the funnel is also called the “evaluation stage,” when prospects are weighing their options, kicking the tires, doing the last bit of research before making the final purchase decision. It’s a great time to share tips and information, and find other ways to provide immediate value – via bot. Any questions someone asks that can’t be answered with pre-programmed responses right away are immediately forwarded to Arri in either email or Facebook Messenger. 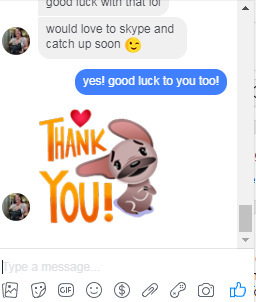 Once Arri answers the question, the user gets a Facebook Messenger notification to check out his reply. How does this work with a big brand? 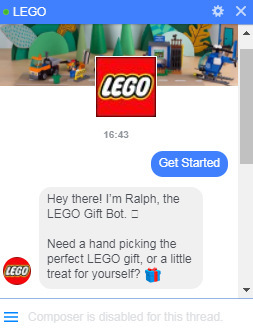 LEGO’s bot Ralph is a great example of middle-of-funnel bottage. Ralph takes users through a pre-scripted question-and-answer sequence where users respond via multiple-choice answer. It’s a clever way to circumvent the main issue with bots – it’s hard for them to come up with useful answers to unusual questions. Narrow the scope though, and you have an enjoyable, helpful interaction. The bottom of the funnel is where the rubber hits the road – you make the sale, or you don’t. “Let’s say you’ve put someone through a 5-day sequence. By the 5th message, you have pretty much nurtured and built a relationship with them and it’s time to offer the next step. Not everyone that subscribes to your bot is a qualified lead, but you can use the chatbot to ask questions and see if they are the right fit for your business. If they are a fit, you can send them a link to your webinar or product page. If not, you can simply say thank you. Another BOFU problem bots can help with is cart abandonment – one of the most common causes of head-desk frustration among e-commerce store owners. Make your message fun and chatty, low pressure. An optional step: Offer a limited-time deal to close the sale. The most common problem: a failure to communicate like a human being. And friends don’t just type text back and forth. They use emojis, GIFs, photos and jokes. They use informal language. They’re funny. The second most common problem: Not updating the AI. Bots have artificial intelligence built in which allows you to teach bots to answer questions on the fly. That only works if someone is responsible for regularly updating the AI by first observing how people interact with the bot, recording common questions, and supplying the bot with the answers. That’s the response you want. And the third most frequently-seen issue: A lot of people are ignoring the 24 +1 rule. So play by the rules. Script with personality, using humor, emojis and GIFs where appropriate. Think of your bot like you’re writing for a character, one that’s suited to your audience. Keep a record of bot conversations so you can see what users expect from your bot, what they’re after, and whether or not the bot is able to deliver. 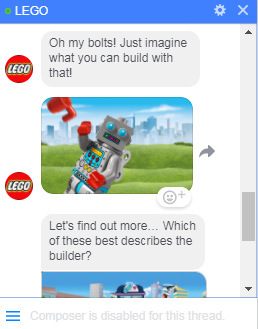 Train your bot to answer the most frequently-asked questions, or script the experience around what most people come for (like LEGO does). Always keep your sales funnel stage in mind. What does your user need at the stage they’re in? Useful information that builds the relationship? More detailed information to make a purchase decision? A reminder to finish their purchase? Whatever it is, you can create an automated bot sequence for it. Always, always make it fun.